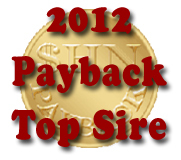 Once again competition was tough for the Top Sire Award, resulting in a tie for the #2 spot! AM Double Dream was #1, earning a check for $1209. The #2 position was a tie between Romeo VF+/ and Aul Magic+/ -- each taking home $605. All three also won a SHN Payback letterman's jacket as the Payback sires whose offspring amased the most points at this year's Sport Horse Nationals. Congratulations to all these stallions on the success of their offspring! We wish them many more years of championships!